WHY IS ACTIVE MANAGEMENT UNDERPERFORMING THIS YEAR? 2016 has so far been a difficult year for active managers (long only stock-pickers and hedge fund long/short equity managers). If we take the US equity markets as the main proxy we see that the MSCI USA Index is up just +1.3% for the year. It does not really reflect the reality of what happened at the sector level. The difference between the best performing sector (Telecoms & Utilities +11.1%) and the worst performing sector (Information Technology -3.9%) is 15.0% as of today. 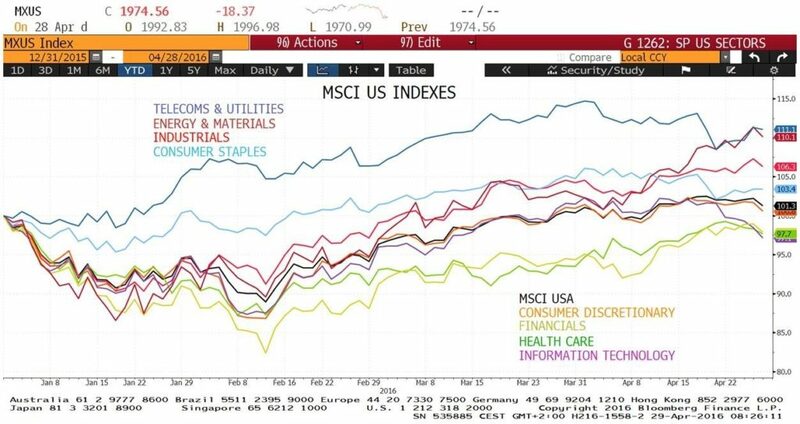 At the bottom of the markets on February 10th, while the MSCI USA index was down 11.0%, the difference between Telecoms & Utilities and Financials was 22.0%, only 6 weeks into the year! The biases for a large number of active managers was to be long Information Technology, Healthcare and Consumer Discretionary where there was and still is good growth (both top line and profit) and to be underweight or short (for hedge funds) Telecom & Utilities, Energy & Material and Industrials (mostly as Oil collapsed from over $100 to as low as $26). So that fact that equity markets sold off sharply in a short period of time (where managers had to risk-manage their books by often reducing exposures) coupled with this large sector rotation have been detrimental to performance. Concerns about global growth, the sharp up-reversals of Oil and Gold and the crowdedness of some stocks and sectors have been the main reasons for these moves. Equity market volatility has recently decreased and global equity markets have recovered. We think that fundamentals are slowly taking over and that rationality is coming back which should benefit active management. Difficult to call a bottom in such a complex sector which is exposed to political risk, but there are some reasons to believe that there is an attractive asymmetrical risk profile for buyers in the biotech sector, one of the few growth sectors in the current macroeconomic environment. Previous Perception vs. Reality: Hedge Funds - Bad results, but neutral on a risk-adjusted basis.